Here’s a Breaking News and as always, it’s ONLY on Bollywood Hungama. It’s finally confirmed! The past few months have witnessed tremendous speculation about the release date of KITES. Initially, it was said that KITES would arrive in Diwali. Later, it was January, coinciding with the release of Hrithik Roshan’s debut movie KAHO NAA… PYAAR HAI. Much later, news poured in that KITES would open during the onset of summer vacations, in April. But the release date has been sealed finally. The film will be released worldwide on May 14. Interestingly, two more biggies are slated for release in May – HOUSEFULL on 20th [Thursday] and RAAJNEETI on 28th. New Delhi: Three Idiots may be creating box-office history. But all’s certainly not well between Chetan Bhagat, the author of the book Five Point Someone from which the movie has been adapted, and its hero Aamir Khan, producer Vidhu Vinod Chopra and director Rajkumar Hirani. An ‘idiotic’ controversy has broken out over accusations of credit poaching. The film credits the story to Abhijat Joshi and Hirani. Bhagat’s name appears at the film’s end. Bhagat is miffed that the film does not give him due credit, but Khan claims that Bhagat is trying to take away credit from Joshi, the film’s scriptwriter. Agencies have quoted the actor as saying that he has advised Chopra and Hirani to file a case against Bhagat as he has defamed them with “false’’ allegations. Chopra too jumped into the fray on Friday. When the controversy was brought up by journalists at a press meet in Noida, he thundered, “Have you read the book? I have read the book, so shut up!’’ He also charged Bhagat with trying to gain publicity for his book. But Bhagat was quick to retort that he didn’t need this kind of fame and he couldn’t help it if millions of people who had read his Five Point Someone had spotted the issue. Reliance Big Pictures filed a police complaint against Galaxy Cinema suspecting it of helping in making pirated DVDs of the film 3 Idiots in Ghaziabad on Thursday. “The pirated DVDs of the film were available in the market from December 24 and it was from those prints that we got hold of the cap code marking which matched with this cinema hall. We then lodged an FIR against the hall,’’ Ghaziabad station road SHO Rashid Ali told TOI. It is learnt that the DVDs of the film were found in Delhi and UP which was tracked by Reliance. Kamal Gianchandani, COO (distribution) of Reliance Big Pictures, clarified, “The sleeves of the DVDs were available in the market but some of them did not have DVDs of the movie inside. Our enforcement team with the local authorities spoke to the local pirates and asked them not to sell the DVD for the first three weeks and also the MSOs asking them not to screen it for the first three weeks. Most of them honoured the commitment.’’ Nearly 2,000 DVDs were confiscated in raids conducted in Chandni Chowk, Delhi, and Sirsa in Haryana. ANY LESSONS LEARNT FROM 2009 MISTAKES? Overall 2009 was a disappointing period for Bollywood. As what Ak_India mentioned in his DP that only 8% of films succeeded in this year which is very shocking. Many films got a nice opening and were well received by audiences as well as critics. Still, the films were hailed as Flop or Average due to their high costs. And that was one of the biggest reasons behind the debacle of many films. Films like Billu, Delhi-6, Kambakkht Ishq, Kaminey, Wake Up Sid, All The Best, London Dreams, De Dana Dan etc could had been super hits were they not produced and sold for such high prices. The problem of sky-high costs was accelerated by the wrong release time. Due to the producer-multiplex feud, no movies were released in the lucrative April and May period. As a result, as soon as strike ended, films after films started pouring every Friday. Obviously, common man cannot be expected to watch all films that release and thus, many films failed or did low business. For instance, All The Best could had been successful if it had not released with Blue. Aladin would have fared better had it not clashed with London Dreams. Jail would have got lots of audience if it had not released with the super hit Ajab Prem Ki Ghazab Kahani. Unfortunately, there is no concrete solution for the 2nd problem. Due to the strike, there is still a huge backlog that needs to be cleared and hence, in 2010 too, one might find multiple releases on lots of Fridays. But the cost of the film can definitely be cut down and the best solution is that the actors slash their prices. Why do superstars like Akshay Kumar charge 20+ crores? And why do producers agree to pay them? Biggie actors should not be given more than 8 or 9 crores. And if this upsets them, then they should be paid more but only if their film succeeds at the box office. This kind of arrangement would benefit all. Movies that are made for 40-50 crores at present would be finished in less than 30 crores. Thus, such film will have high chances of recovering their costs too. Sadly, no one is thinking of enforcing such an alternative. And as the chapter of 2009 closes, we could see multiple releases even in the last week. Today (i.e. last day of 2009), 3 small films are slated to release-Raat Gayi Baat Gayi (RGBG), Accident On Hill Road (AOHR) and Bolo Raam (BR). It is obvious that all 3 of these films are going to flop. If only one film had hit the screens today, it would have chances of profiting. But no film will profit in this rat race. Not to forget, the 3 Idiots craze is still going on. Hence, all these films have dug their own graves by releasing today. RGBG looks like a complete entertainer; AOHR may work if it has a well-written climax. BR may be hard hitting but it will surely have lowest collections. When will these people learn? 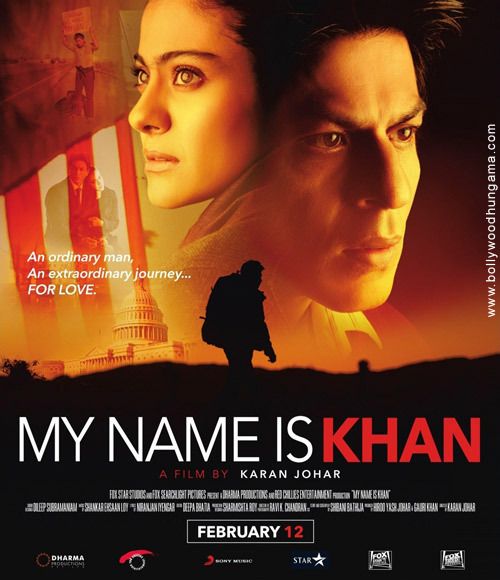 MY NAME IS KHAN: A winner for sure! Although the film looks serious, it has managed to arouse curiosity. And anyways, the name of Shah Rukh Khan is enough to make almost everyone sit up and take notice. Kajol being paired opp SRK is like an icing on the cake. Also it has talented actors like Jimmy Shergill which, I don’t think, will be revealed in promos till the flick releases on Feb 12. The first look of the film made people assume that it’s based on terrorism. However, it’s not! To quote SRK, “It’s a love story with an epic feel” (Bombay Times). MNIK is thus expected to work not only in India but overseas too. RAAVAN/RAVANA: Mark my words; this one would rock big big time! Unfortunately, when Bolly websites are discussing 2010 biggies, they aren’t mentioning this flick. There are many reasons as to why this film is special. Firstly, it is directed by talented-creative Mani Ratnam who never goes wrong. Secondly, it’s a present day version of Ramayana. And thirdly and the best part, the star cast and the characters that they play are just out of this world! Aishwarya Rai Bachchan plays Sita but Abhishek Bachchan isnt playing Rama! Instead, he’s Raavan in the film, i.e. the villain! Southern actor Vikram is Rama! Guess who plays Hanuman? None other than apna Govinda! Just imagine-Govinda in Mani’s film! Cool isnt it? Nikhil Dwivedi and Southern beauty Priyamani completes the main cast. The film is bi-lingual-it was shot in Tamil too but with slight change of cast. Vikram who plays Rama in Hindi version is Raavan in the Tamil version (hats off!). Prithviraj Sukumaran instead is Rama in Tamil version! Aishwariya Rai is acting in both the versions! The film is expected to release in May. Make sure you don’t miss it at any cost! TO BE CONTINUED NEXT THURSDAY! RAAT GAYI BAAT GAYI releases on the last day of the year, 31st December. If this wasn’t surprising enough, the fact is that the date also falls on a Thursday. Wait, there is more. There are two more films slated for release on the same day – ACCIDENT ON HILL ROAD and BOLO RAAM, hence adding on to the crowd. Moreover, there is this entire 3 IDIOTS euphoria which is expected to spill over well into the second week. With so much happening around the release of this Neha Dhupia, Rajat Kapoor and Vinay Pathak starrer, was it a justified decision to arrive on this day? Why did Genelia D’Souza rush to meet her director Ken Ghosh at midnight on Christmas Day when her family waited for her at home for the festivities? At midnight on Thursday when Christmas day started, Ken Ghosh finished editing and post-production of Chance Pe Dance and was feeling like sharing the moment with his lead pair. Shahid Kapoor however, was unavailable. Genelia, Ken thought, would be busy celebrating Christmas with her family. On Thursday evening, a major fire broke out on the sets of Anees Bazmee’s No Problem. The unit was shooting in the middle of the sea for a vital action sequence. Suniel Shetty and Vishwajeet Pradhan almost became a victim of severe burns. However, prompt action saved them. The fire extinguishers on the sets proved to be very handy. Suniel burnt his hands while Pradhan’s left leg suffered from major burns. 3 IDIOTS has embarked on one of the biggest starts ever. The film collected an enormous approx. Rs. 2.5 crores in paid previews on Thursday, which is the highest ever for a Hindi film. On Friday morning, the film started with a bang, opening to an extra-ordinary response from East to West, from North to South. Early indications are that the film will have a solid first day, at par, or perhaps more than GHAJINI. The industry feels that the Day 1 figures would be more than Rs. 10 crores nett. Fingers crossed.